When lit, it will conjure up images resemble twigs and trees in the forest. Shadows generated by these lights will fill the entire room. 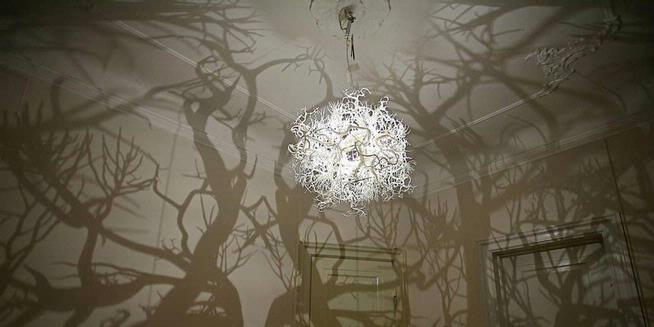 Instantly, the room will be filled with shapes resembling twigs, stems, and roots of trees. The brighter the light, the resulting shape will also be more clear. Meanwhile, when the lights dim deliberately, hanging lamp will project a shape similar to the appearance of a fire in the woods. The impression created by these lights really depends on the imagination of the “wild”. You can see it as an impression of incredible magical forest, or precisely very creepy. Whatever you imagine, in fact this is a project designer lamps Hilden & Diaz. The designer was inspired by the drawings of German biologist, Ernst Haeckel (1834-1919). They created a symmetrical shape around the light source. Thus, while it is not turned on, the light is almost in a circle with intricate details.